During the transition of juveniles from fresh water to estuarine and coastal environments, the survival of Pacific salmon (Oncorhynchus spp.) can be strongly size selective and cohort abundance is partly determined at this stage. Because quantity and quality of food influence juvenile salmon growth, high rates of prey and energy acquisition during estuarine residence are important for survival. 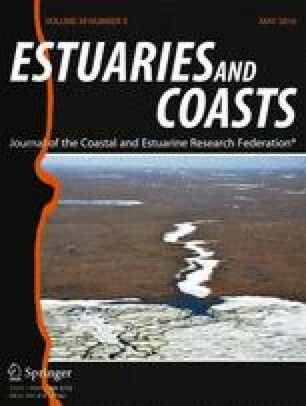 Human activities may have affected the foraging performance of juvenile salmon in estuaries by reducing the area of wetlands and by altering the abundance of salmon. To improve our understanding of the effects of wetland loss and salmon density on juvenile salmon foraging performance and diet composition in estuaries, we assembled Chinook salmon (Oncorhynchus tshawytscha) diet and density data from nine US Pacific Northwest estuaries across a gradient of wetland loss. We evaluated the influence of wetland loss and density on juvenile Chinook salmon instantaneous ration and energy ration, two measures of foraging performance, and whether the effect of density varied among estuaries with different levels of wetland loss. We also assessed the influence of wetland loss and other explanatory variables on salmon diet composition. There was no evidence of a direct effect of wetland loss on juvenile salmon foraging performance, but wetland loss appeared to mediate the effect of density on salmon foraging performance and alter salmon diet composition. Specifically, density had no effect on foraging performance in the estuaries with less than 50 % wetland loss but had a negative effect on foraging performance in the estuaries with greater than 50 % wetland loss. These results suggest that habitat loss may interact with density to constrain the foraging performance of juvenile Chinook salmon, and ultimately their growth, during a life history stage when survival can be positively correlated with growth and size. The online version of this article (doi: 10.1007/s12237-015-0041-5) contains supplementary material, which is available to authorized users. The authors deeply appreciate the many people who originally collected the salmon used in our analyses and who generously shared their data, including A. Bieber, M.A. Lott, T.S. Nelson, G.T. Ruggerone, and T. Cornwell. Many other people and organizations provided extensive assistance in the field, processed stomach samples, assisted with the identification of prey taxa, and provided general guidance, including L. Stamatiou , W. Duval, C. Levy, B. Armbrust, E. Morgan, E. Perez, A. Lind-Null, K. Stenberg, and the Oregon Department of Fish and Wildlife. D.A. Beauchamp and T.P. Quinn provided guidance for the study and constructive criticism of the manuscript. Funding for the original data collections was provided by the US Environmental Protection Agency, the US Fish and Wildlife Service, Oregon Sea Grant, Washington Sea Grant, the Nisqually Indian Tribe, King County Conservation District, and King County Department of Natural Resources and Parks. A.T. David was supported by a US National Science Foundation Graduate Research Fellowship. Finally, they also thank the anonymous reviewers whose feedback improved the manuscript.